Let’s add to the workflow process that we built in our last blog. Open the “TestFormDef” Workflow Definition using the designer. Enter a value for the Task Name property. As we did in the instantiateform step, enter “variable.formID1” for the Variable holds the form instance ID property. Click the Select users to route to “…” button and select a user. Save the user selected. The save the Workflow definition using the “Save” button on the toolbar. Now let’s re-execute the Workflow Instance created previously. Select the Workflow Instance and click the “Execute” button on the toolbar. As the rendered Workflow shows, the instantiateform step has completed. 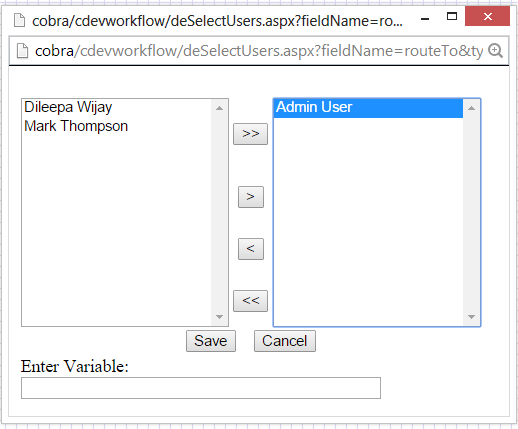 The routeform step has routed the form instance as a task and is waiting for the task to be completed. Let’s open the task list and complete the form and task. As we did above, you can select the instance and click the “Render” toolbar button to view its execution. From there you can click the Forms toolbar button to view the form with its data.